Dr. Virender Kumar Khosla, MBBS, MS (General Surgery), M.Ch (Neurosurgery), FICS, MNAMS, with an acclaimed experience of more than 3 decades, is Director - Deptt of Neurosurgery at Fortis Hospital, Mohali. Prior to joining Fortis Hospital, he was associated with the premier institute PGIMER, Chandigarh where he served as a Professor & Head of the department of Neurosurgery. Dr. Khosla after completing his M.B.B.S, went on to pursue his post graduation in General surgery, tailed by superspecialisation in Neurosuregry. To his credits, Dr. Khosla has been honoured with various national as well as international awards and has the distinction of being international guest faculty at various International Medical Universities. Having a long professional Career, he has conducted extensive research in his clinical field and also served as the Principal - Investigator for many projects. Dr. Khosla has a number of research projects and publications both in national and international journals in his name. 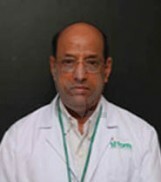 His expertise in neuro world has contributed many chapters in both national as well as international books. He is the author of the academic publication - Brain Protection and Neural trauma. ***I have experienced best service in Fortis Mohali and specially Doctor V.K Khosla is master of his field. He is like a god to me who has given me another chance to survive & enjoy this beautiful life again.